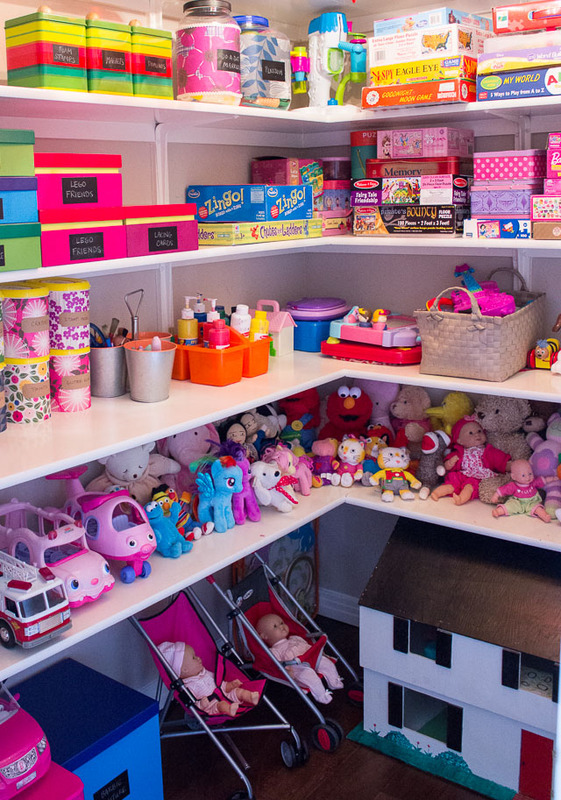 Reign in Your Kids’ Toys with These Simple Storage Ideas! 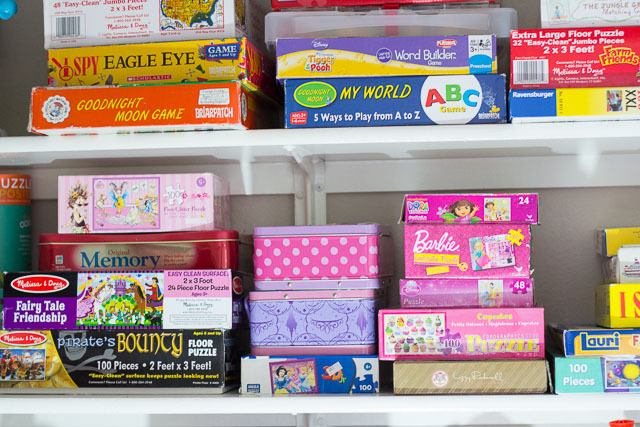 Toys are one of the hardest things to organize don’t you think? It seems there are so many little pieces strewn everywhere you look and it is hard to know where to begin picking up at the end of the day. There are many nights when I shut the door on the playroom mess to deal with it tomorrow (unfortunately my girls aren’t the best at picking up after themselves – if you have tips, please share!!). However, organizing their toys has gotten easier in our new home with the addition of some closet space and some better storage systems I put in place. 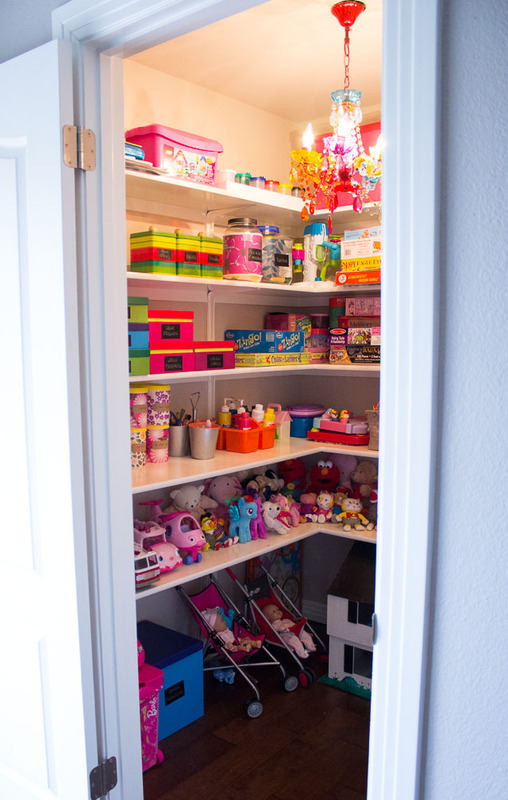 I recently tackled the closet in the girls’ playroom and I wanted to share a few tips. You can use these with or without a closet! 1. 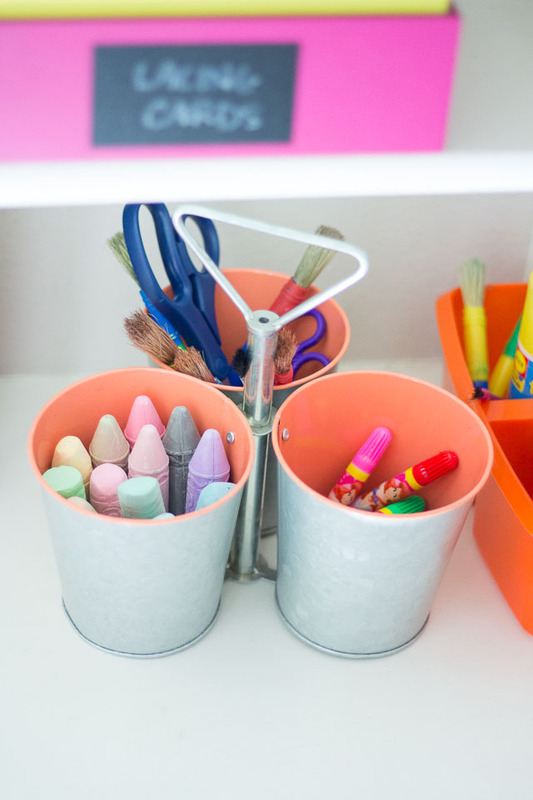 Use pretty containers for small pieces – The hardest thing for me to figure out what do with is all the girls’ small toys, primarily their arts and craft stuff. I have found that putting similar items in boxes or bins has been a big help in corralling it all. I found these really cute and colorful boxes at Target this winter. Unfortunately, they were only available around Christmas, but I bought them up in the after-Christmas sales for only a couple dollars each. I thought they would be perfect for toy room storage. The tins at the top are actually kitchen tins, but work great for small toys! 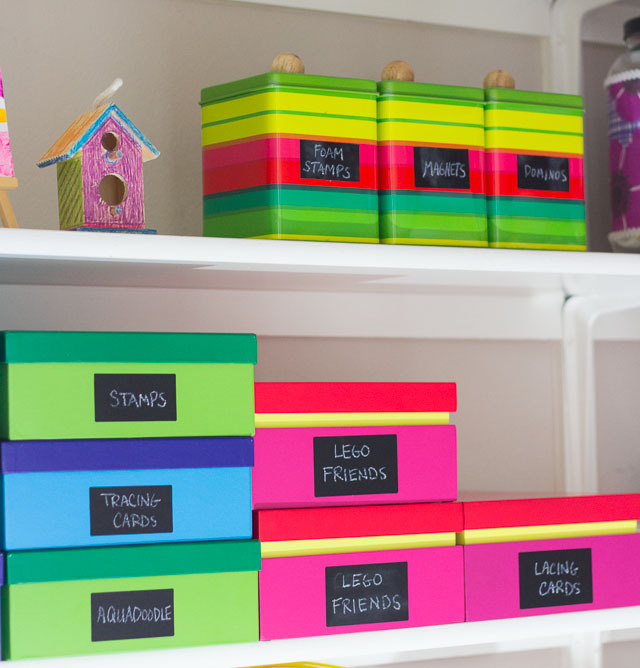 Keep an eye out for similar colorful storage – I found these colorful containers at Amazon. 2. 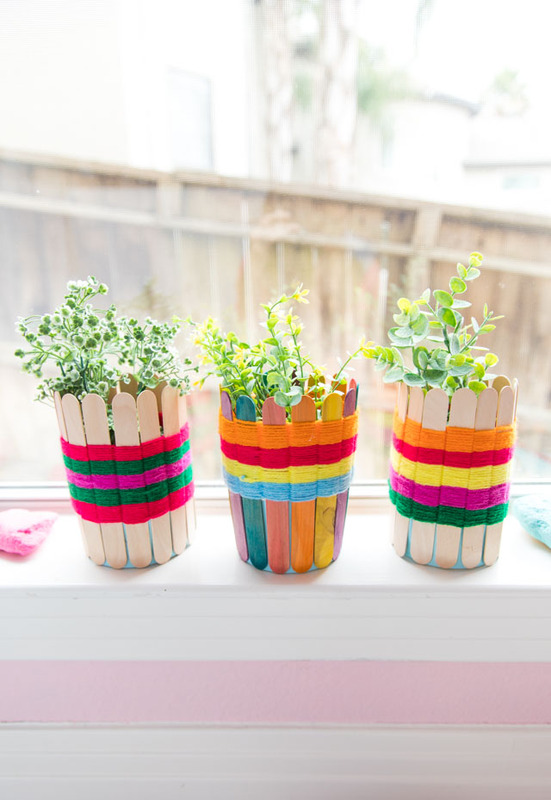 Make your own containers – if you don’t want to spend money on containers, make your own! Many of the containers in the playroom closet are repurposed food containers, such as these small bins made from baby formula containers. Check out the full tutorial. 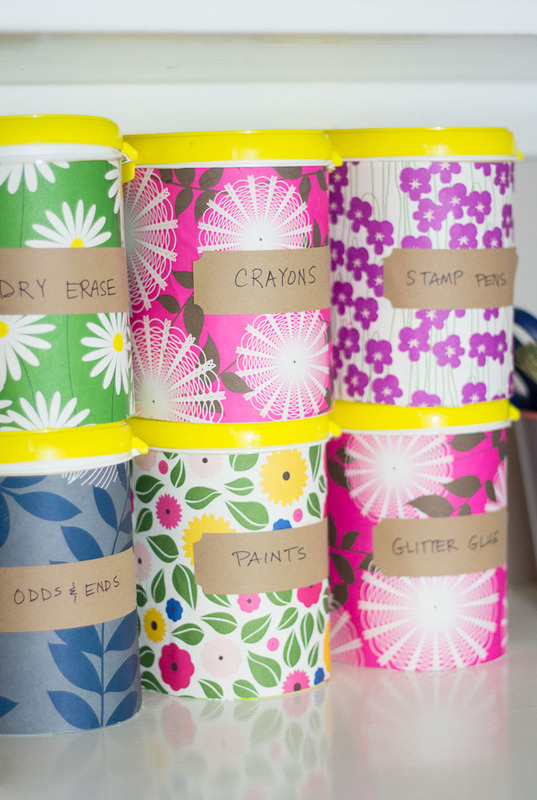 I also covered larger containers (Costco-sized pretzel and animal cracker tubs) with pretty paper – here is how. Old shoe boxes covered in pretty paper also look great! 3. Use caddies – I love using caddies for markers, paint brushes, chalk, etc. 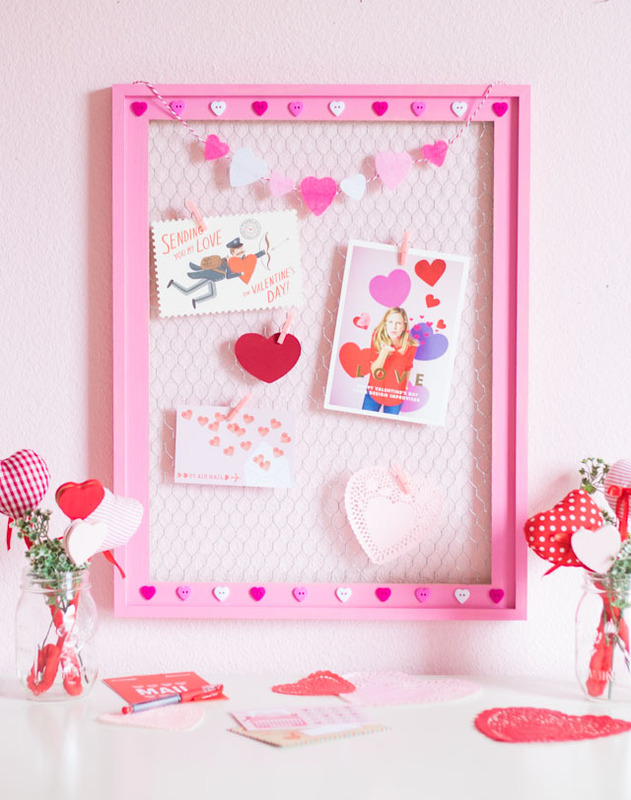 It makes it easy to organize them and move them around to wherever the girls are crafting. This is a utensil carrier turned art supply holder! 4. Put toys that you want to make accessible the lowest – Whether you have a closet or a bookshelf, it helps to organize it based on what you want your little ones to be able to reach, and what you don’t. 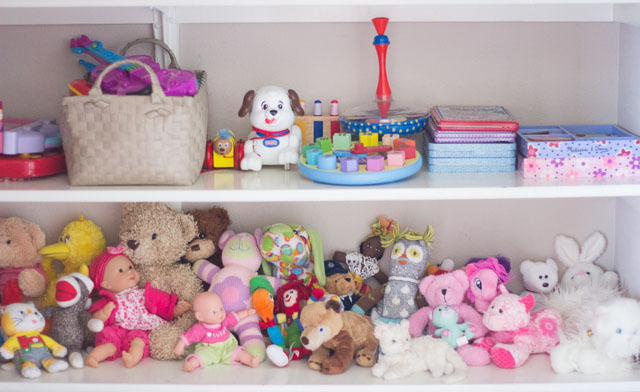 The bottom shelf of our playroom closet holds the girls’ stuffed animals. It is frequently emptied out by Hazel, my 2 year old, and all the animals end up in a heap on the playroom floor – usually with her buried in there somewhere. I used to have all the stuffed animals in a big basket, but I’ve found that putting them out on the shelf the girls were more likely to play with them. I keep the stuff I don’t want my 2 year old getting into on the shelves higher up! 5. Corral similar items in baskets – I incorporated a couple baskets into the closet to hold similar toys – for instance, one holds all their little musical instruments. That makes it easy for them to grab the basket and play with the instruments all at once. 6. 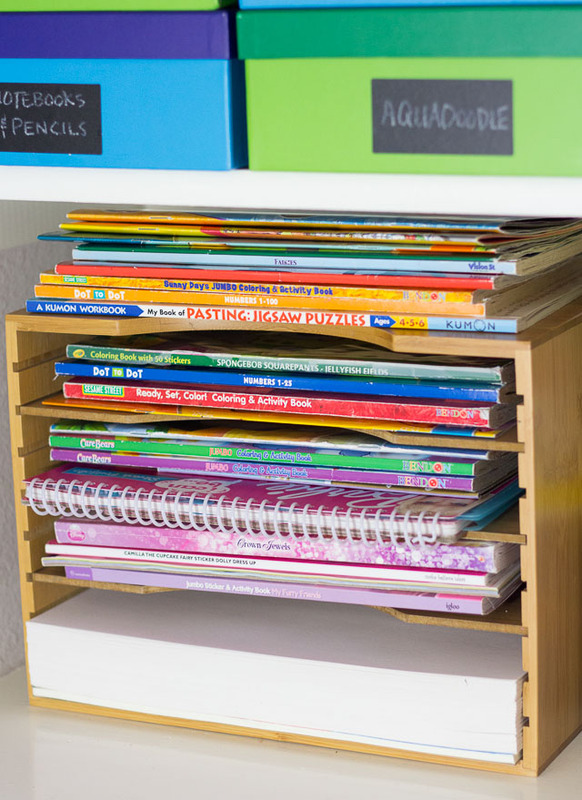 Sort coloring books and paper in a file organizer – I love this bamboo file organizer I bought from Amazon. 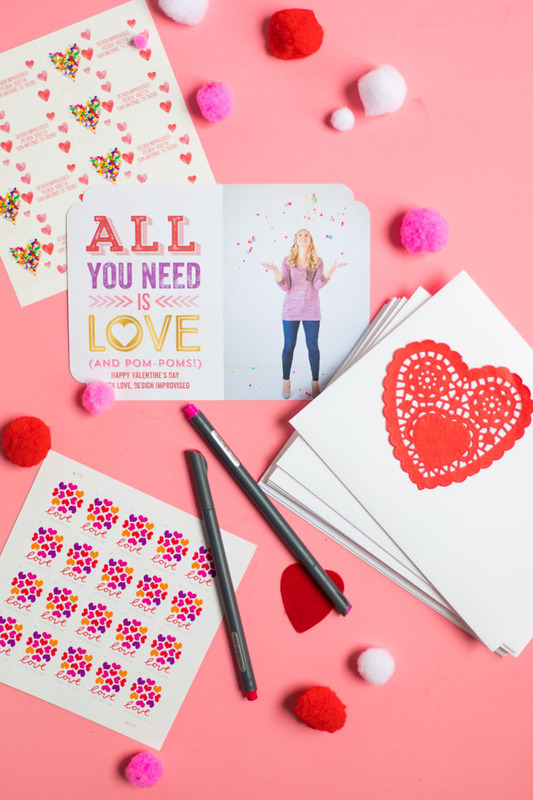 It fits their coloring books perfectly and makes it easy to see find a particular one. 7. Label, label, label – since my girls can’t read yet, the labeling is purely for my benefit, but it helps! 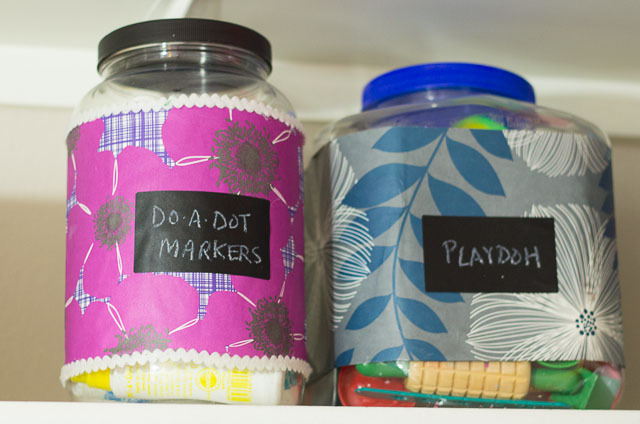 I used my favorite respositionable chalkboard labels . You can easily peel them off and stick them on something else if you need to. 8. 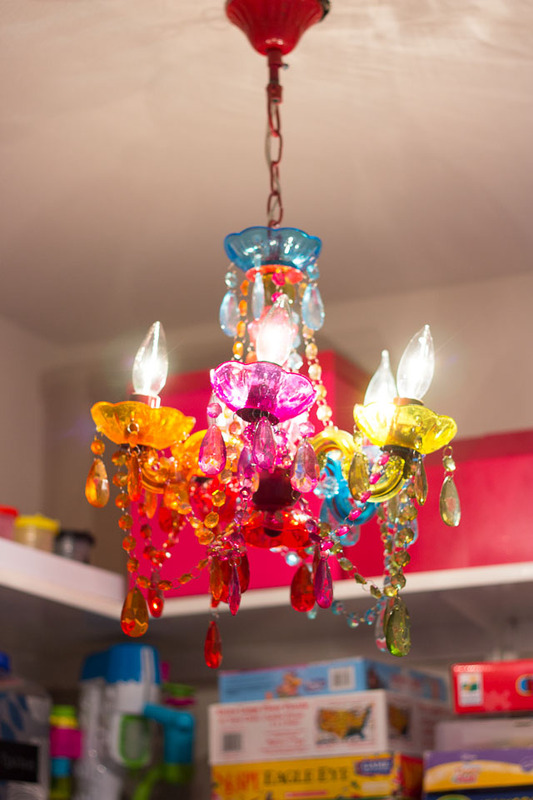 Jazz up a closet – for fun we put this colorful kids’ chandelier in the girls’ closet. It was left in one of the bedrooms by the previous owners. I also put a couple pieces of art on the closet wall. 9. Refresh every couple months – The closet doesn’t look this organized for long. Despite my best efforts, this closet tends to get out of control after a couple months of hastily putting things away. I’ve found that spending 30 minutes every so often to kick it back into shape has been a big help. 10. Shop at Goodwill or Salvation Army! – This is my plug for buying toys at thrift stores. I had great luck in Chicago finding toys at the local Salvation Army. So far here in San Antonio, the Goodwill seems to have a smaller selection of toys and they seem overpriced for the condition they are in. The quality and selection varies city to city, but it is worth checking out. Nearly all of the games and puzzles in this closet I got from Salvation Army for $1-$2 each. I only had a couple instances where a piece was missing! 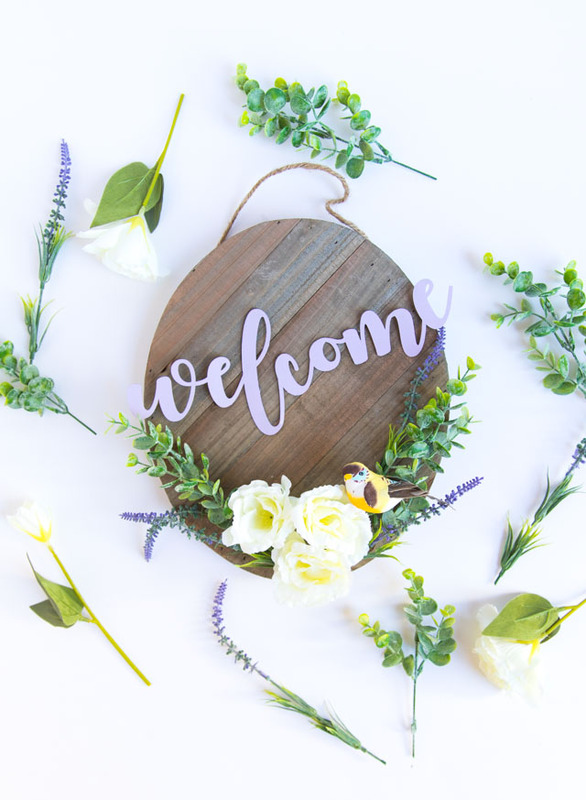 Garage sales are another great source – there were a couple churches in Chicago that held kids garage sales that I found some amazing stuff at! Want to see the other closets I’ve organized? 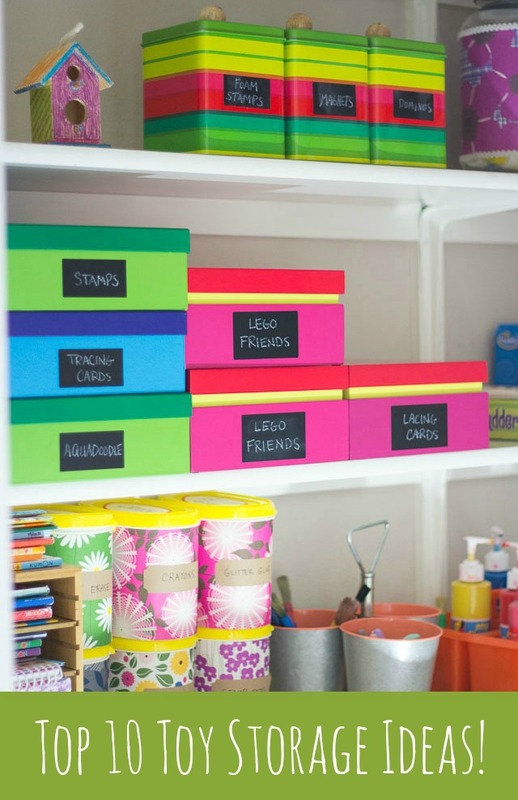 Check out the girls’ bedroom closet and our kitchen pantry!